The list of “Next Wave” projects will not be nailed down until the February 2013 Board meeting following a round of public consultation. It is likely that construction of the Downtown Relief and Yonge Extension subway projects would take place concurrently with Yonge to Steeles opening at roughly the same time as the DRL from Downtown to Danforth. “Phase 2” of each project would follow. At this time there is no commitment to going north of Danforth or to any specific route either through downtown or through the east end of Toronto. This will be the subject of an Environmental Assessment for the project. The goal of TBM was described by McCuaig as having 75% of GTAH residents within 2km of rapid transit at their origin or destination. That “or” is an important distinction I don’t remember hearing before. It’s child’s play to have lots of people close to rapid transit at one end of their trip — anyone who works in major centres within Toronto or lives along a subway, LRT, BRT or GO line will qualify. The more difficult target is to have such access at both ends of the trip because “convenience” is meaningless if only one end is well-served. In an apparent contradiction to the implied 1/3 local funding described in the Star’s article about Mississauga having second thoughts on the LRT project, McCuaig said that we cannot look at traditional federal/provincial/municipal financing models. Presumably the Investment Strategy will address this problem. The actual timing of the Next Wave projects varies depending on which document one reads or how one parses the announcements. In the Next Wave handout (linked later in this article), this is described as a 15-year, $34-billion project. The spend rate implied by another part of the same handout is only $1.2b/year, and this translates to a 28+ year timeframe. Metrolinx, in an email responding to this article and my concerns about the status of projects such as the Eglinton LRT to the Airport, said that there would be a “Third Wave” in 2025. At the press briefing following the Board meeting, McCuaig confirmed that for the “15 year plan”, year zero has been reset to 2012. This implies that TBM’s original 15 year timeframe is now stretched to roughly 20. Moreover, McCuaig hinted that projects started within the next 15 years may not finish by then. Despite all of the delays, the year 2031 is still the target for completing all of The Big Move. In previous discussions of the Investment Strategy, Metrolinx has included an allowance for operating the new facilities as they come into service. This is missing from the $34b of the Next Wave, but will have to be incorporated into the IS discussions. Moreover operating costs are ongoing while capital are one-time. In all of this discussion it was amusing to listen to Metrolinx talk about revenue tools, code for the very things some politicians in Toronto find utterly unacceptable preferring to imagine that pools of private capital are available at little or no cost. The presentation materials from the Board meeting are not yet online, but the hard copy version comes under the unhappy title of “The Big Move In Action”. Deleting only one space would give a good description of the treatment of project schedules for Transit City by Queen’s Park. 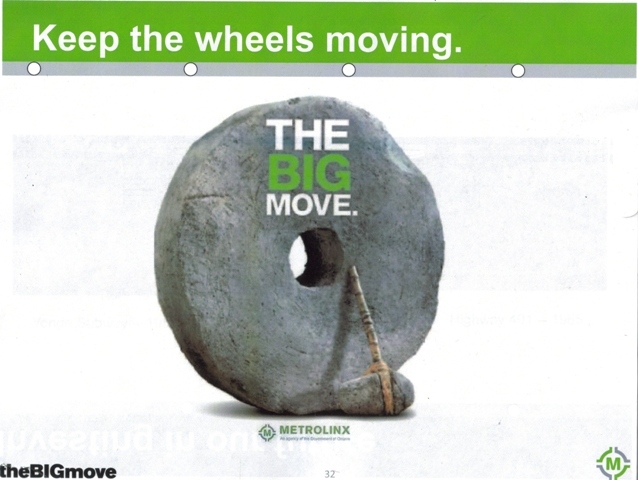 The presentation ends with a page titled “Keep the wheels moving” and a picture of a stone wheel and hammer. Ontario makes a lot of claims for its triumphs in transportation technology, and I can’t help wondering if this is an early product of the Ontario Transportation Development Corporation. I mention this because Metrolinx appears to have embraced a new, quaint graphic style for their Big Move and Union Pearson Express websites.